Do cataracts happen to both eyes at the same time? Is cataract surgery performed in a hospital or as a outpatient? Is cataract surgery performed under a general anaesthesia? How is the style and power of the lens implant determined? After the surgery will my cataract come back? You are about to embark on an exciting adventure in maximizing your vision quality! When it comes time for your cataract / lens implant surgery, it is perfectly normal to be a bit apprehensive or nervous, as before any unfamiliar experience. However, rest assured that the great majority of our patients say their eye surgery was remarkably pleasant, and that pain was not even a consideration. Our doctors utilize every possible means to make sure you are completely comfortable throughout the entire procedure. A cataract is a clouding of the eye's internal focusing lens. For most people it gradually develops throughout life and may cause visual difficulty by their 60s to 70s. Cataracts develop because of a natural aging process in the lens itself. Ultraviolet (UV) exposure may play a role, and some cataracts are caused in younger people by trauma, medications (such as steroids), genetic conditions or other systemic medical conditions, such as Diabetes. Early on, cataract symptoms can be very mild. Many people notice a distracting glare from oncoming headlights when they drive at night. Also, it may require more and more light to comfortably read, even while wearing glasses. Some people notice that television captions become increasingly difficult to read. As the cataract progresses, blur worsens and the quality of colour vision declines. Some cataracts progress slowly over years, whilst others can cause significant visual decline over months. Sometimes they do. During a complete eye examination, we evaluate vision and the total health of the eye, also screening for other disorders like glaucoma, macular degeneration, and diabetes. This allows us to determine whether a change in glasses would provide a significant improvement in vision. 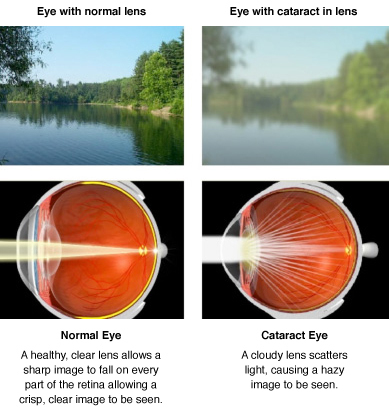 When cataracts become severe, even new glasses will not help because the eye is seeing through a cloudy internal lens that can not be corrected with glasses. The decision to proceed with cataract surgery should be made with your doctor after he/she measures your vision, examines your eye(s), and listens to your description of the visual problems you are experiencing. With modern medical technology, cataracts are routinely treated safely and effectively using microsurgical techniques. Today, cataract extraction is one of the most successful surgical procedures- with greater than 99 percent of all cataract surgical procedures resulting in improved vision. During the early stages of cataract development, more frequent changes in your eyeglass prescription may be sufficient to restore adequate vision. Surgery should be considered when the reduced vision caused by cataracts begins to interfere with normal daily activities such as reading and driving, even when corrective glasses are used. Although the potential risks of surgery must be weighed against its potential benefits, unnecessarily delaying surgery can lead to accidents when driving as well as personal injury such as falls. In addition, the surgical removal of advanced cataracts is more difficult than the removal of less dense cataracts. I do not feel safe driving because of difficulty reading signs, glare from lights at night, or other visual disturbances. I do not see well enough to do things I enjoy, such as reading, sewing, or playing golf. Because of my poor vision, I may bump into things, stumble, or fall. Because of my poor vision, I am not as independent as I would like to be. I cannot see as well as I would like to see, even with my glasses. An eye examination will determine if cataracts are the cause of your diminished vision. Wearing ultraviolet (UV) protecting sunglasses may help reduce the progression of cataract. It is worthwhile for most people to investing in a good quality pair of sunglasses, which need not be very expensive. Also, a balanced diet containing a reasonable amount of antioxidant vitamins may help slow cataract development. Cataracts cannot be reversed. Generally, age-related cataracts progress at about the same rate in both eyes. Many people are more bothered by cataract symptoms in one eye first, however. During an examination, we can determine whether any other conditions such as macular degeneration are also contributing to difficulty with vision. Cataract surgery restores quality vision for millions of patients each year. It is one of the most successful procedures modern medicine has to offer. Good vision is vital to an enjoyable lifestyle. Numerous research studies show that cataract surgery restores quality-of-life functions including reading, working, moving around, hobbies, safety, self-confidence, independence, daytime and night-time driving, community and social activities, mental health, and overall life satisfaction. Cataract surgery is performed as an outpatient in an accredited hospital. At Specialist Eye Centre, your options include: Bathurst Base Hospital or Lithgow District Hospital for public patients, or Bathurst Private Hospital or Lithgow Community Private Hospital for private patients. Surgery itself takes about twenty minutes in the operating room. Most people are in the hospital for a few hours, including pre- and postoperative time. Is cataract surgery performed under a general aneasthesia? Cataract surgery is performed with local anaesthesia only. We provide intravenous medications to help patients fully relax. We also administer local medicines around the eye so that patients don't feel anything and don't see anything during surgery. Most people say that there is no pain during or after cataract surgery. They may experience a scratchy sensation (like an eyelash in the eye) and mild soreness for about 24 hours after surgery. If necessary, they take mild painkillers which are provided. An artificial lens implant made of acrylic plastic is folded into a small package, then inserted into the capsule and unfolded in the proper position. In this position, the new lens will remain permanently. It will never need maintenance or replacement. The new lens can be selected to correct nearsightedness, farsightedness, and in some instances astigmatism as well. 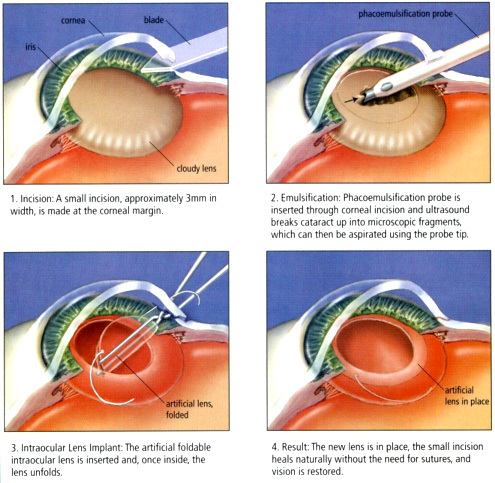 Many people believe that cataract surgery is typically performed with a laser. In fact, this is one of the most common misconceptions in medicine.In some cases, the bag-like capsule membrane that supports the artificial lens that replaces the damaged cataractous natural lens may become clouded several months after cataract surgery. In that case, a YAG laser may be used to make a clear opening in the lens-containing membrane. Dr Fernando will discuss with you your visual requirements, and use this information to determine which style of lens would suit you lifestyle best. Prior to your surgery, detailed and highly accurate measurements are taken to ensure the lens power chosen is correct for your eye. You can rest assured that we use only state-of-the–art equipment for these measurements, and pride ourselves on the quality of the results we achieve. After cataract surgery it is impossible for a cataract to come back because the lens of the eye, where the cataract grows, has been removed. The new lens implant will last a lifetime and never need maintenance or replacement. It is possible, however, for a cloudy film to grow on the lens capsule membrane that is located behind the lens implant. This occurs in a small percentage of cataract surgery patients, usually months or years after surgery. Treatment of this film, sometimes called a "secondary cataract", is done with a laser in a simple clinic procedure that involves no discomfort or postoperative restrictions or downtime. With lens implant technology, our surgeons can choose to correct vision to achieve good uncorrected distance vision in both eyes. This allows most people to pass a Roads & Traffic Authority (RTA) test without glasses. In such a case, it would be necessary to wear reading glasses for fine print, though some large print reading may be possible without glasses. Another option after surgery is monovision. 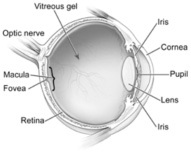 One eye is used primarily for distance, whilst the other is used primarily for near vision. This option allows many people both to read and drive without corrective lenses. This option is usually most successful in people who have previously worn monovision contact lenses or who have had monovision LASIK. Multifocal or pseudo-accomodative lens technology is another method of achieving both distance and reading vision after cataract surgery. Ask Dr Fernando if it is an option for you. Until the next morning after surgery, an eye patch is placed on the healing eye whilst the effects of anaesthesia are wearing off. During this time we recommend restful activity. Eating, watching television, reading, and walking around the house are allowed. After the eye patch is removed, patients can begin administering their postoperative eye drops. For the first few days after surgery, heavy lifting (more than 10kg) is not allowed, and we recommend avoiding eye makeup for one week. There are other restrictions as well after surgery, perhaps relate to you specific occupation or past-times. These are fully discussed with our doctors and counsellors after surgery. For more information about restrictions after surgery, contact us. For around four weeks after after surgery, your doctor may ask you to use eyedrops to help healing and decrease the risk of infection. Ask your doctor about how to use your eyedrops, how often to use them, and what effects they can have. You will need to wear an eye shield or eyeglasses to help protect your eye. Avoid rubbing or pressing on your eye. Your eye will generally be reviewed the first day, week, and month after surgery. This is not a complete list of risks that occur with surgery, and individual patients may have other risks based on their co-existing medical or eye conditions. Our doctors have extensive experience performing cataract surgery in unusual circumstances and can fully discuss these risks during an office consultation. Contact us to schedule your consultation for cataract surgery.